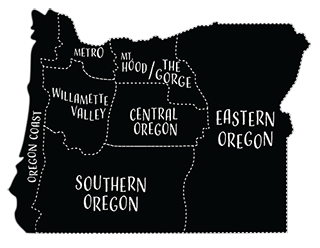 Plying her computer-bound trade in Backporch Coffee Roasters in Bend, 1859 creative director, Aimee Jameson drank coffee and tweaked designs. It was then that a woman approached her with a computer question. The two got to talkin’. Carol Mergenthaler was a local artist and backcountry skier who drove a pristine sky blue 1975 convertible VW Beetle with license plates that read “SKI MUM.” The creative director saw possibilities and got Mergenthaler’s phone number. Weeks later, after testing numerous disappointing concepts for the winter 2012 cover Jameson remembered the “Ski Mum” VW Bug. 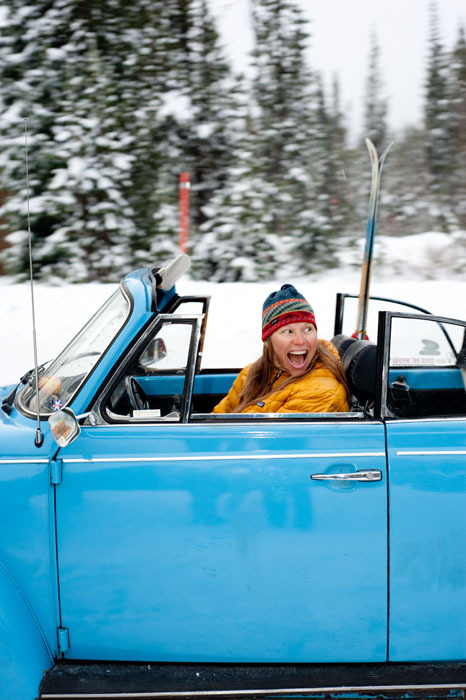 Carol Mergenthaler, and her Ski Mum-mobile were about to become cover models. With Ski Mum and the blue VW Beetle in place, 1859 and one of its photographers, Aubrie LeGault, set off for Mt. Bachelor to capture an iconic image that embodied both winter, Mergenthaler’s enthusiasm and 1859‘s identity.